A "Must See" for every dog's caretaker, Dr. Becker discusses the aging process; how to understand and appreciate it and support your pets as they age. Winding Down offers deep, thorough discussion and information about the aging process, both in health and illness, ways that systems age, support for aging bodies, and planning ahead for end of life issues. With her usual rapid-fire, passionate delivery, Dr. Becker covers these emotion-laden topics with compassion and understanding of the issues involved for every animal caretaker. Spiked with humor, this latest piece of Dr. Becker’s plan for healthy living and aging provides excellent information that carries the same “live healthy, live happy” message of all her work. 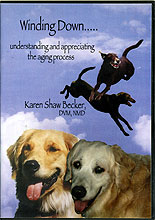 Includes Dr. Becker's 18 point assessment for your pet's "autumn years". Illness (acquiring disease) vs. Aging (progression of life without disease) Factors that influence aging - both positive and negative. In 1989 Dr. Karen Becker attended the University of Wisconsin-Stevens Point majoring in Wildlife and International Resource Management. In 1990 she worked at the Raptor Center of Pueblo, Colorado, rehabilitating hawks, eagles, owls and falcons. In 1991 she worked under the head veterinarian at the Berlin Zoo, Germany. In 1993 she studied the native flora and fauna of Australia at Macquarie University in Sydney. In 1996 she completed the International Veterinary Acupuncture Society’s certification course in Houston, TX. She graduated from the Iowa State School of Veterinary Medicine in 1997 and completed an exotic animal internship in California that same year. Dr. Becker completed the Academy of Veterinary Homeopathy’s certification course in Virginia, 1998. In 1999 she compiled her extensvie training and opened Natural Pet Animal Hospital. Dr. Becker became a licensed Naturopathic Medical Doctor in 2003. Dr. Becker is a member of the American Veterinary Medical Association, the American Holistic Veterinary Medical Association, the Association of Avian Veterinarians, the Association of Reptile and Amphibian Veterinarians, the Association of Wildlife Veterinarians, the International Veterinary Acupuncture Society, the American Association of Veterinary Acupuncturists, the Academy of Veterinary Homeopathy and the National Wildlife Rehabilitators Association. She is a frequent lecturer on wildlife rehabilitation and holistic pet care.